Deciphering those Strange Three-letter Codes for Airports: What does ORD Stand for? Ever wondered what ORD and PIE mean? Why does Chicago O’Hare International Airport have ORD as its three-letter code? What’s with the GEG designation for the airport in Spokane, Washington? What is ORD? Do they make bakery products at the airport that serves the residents of St. Petersburg and Clearwater, Florida, given that its code is PIE? 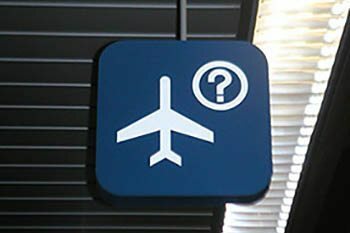 Does Portland, Oregon, have a hidden letter in its name, given that its airport code has the letter X in it? If such questions about the bizarre three-letter codes of many of our nation’s major airports have made you feel anything from perplexed to sleepless at night, well, the following article should help to ease your mind. The mysteries behind many of these strange codes will be revealed here! Many of the unusual airport codes that travelers see on the baggage tags that are put on their luggage are based on the original names of the airports or what installation preceded the space where the current airports are now. Old airport codes have survived over time even while the official names of the airports may change. This helps to keep confusion and costly changes to aviation-related publications in check, as well as to honor tradition, war heroes, and aviation pioneers. ORD: Before becoming one of the world’s busiest airports, Chicago's O’Hare International Airport was the site of an aircraft factory known as Orchard Place; and thus, the “ORD” designation for Orchard. Later, it became a commercial airfield, known as Orchard Field. In 1949, the name of the airport was changed to O’Hare Field, to honor local war hero Edward “Butch” O’Hare. The O’Hare legacy continues on to this day. CVG: Cincinnati’s international airport isn’t in Cincinnati or even in the state of Ohio! The airport is located in Kentucky near the city of Covington, whose three-letter abbreviation is CVG. PIE: St. Petersburg-Clearwater International Airport used to be a military installation known as Pinellas Army Airfield; as a result, the “PIE” abbreviation came from the name Pinellas. It is in this area where the first ever passenger airline ticket was sold on January 1, 1914. Airport officials have actually sent edible PIES to travel agencies and businesses to encourage people to fly to this Florida hot spot! GEG: Major Harold Geiger was a noted Army aviator and balloonist from times’ past. His name is an ongoing, living legacy every time a GEG symbol is put on luggage or freight coming to Spokane, Washington, via the airways. Spokane International Airport was actually named Geiger Field until 1960 when the name was changed to its current nomenclature. MCO: The three-letter code for Orlando’s international airport does not stand for Mickey Mouse Country as some theorize. McCoy Air Force Base used to be at this locale, from which tourists the world over now embark to en route to the Disney theme parks in the Orlando area. IAD, DCA, EYW, and PHF: Cites that begin with the letters K, W, and N aren’t allowed to have airport codes beginning with the first letters of their proper names. The letters K and W are reserved for radio and television stations. The letter N is for Naval Air Station’s usage. So city airports beginning with the above letters have to be creative; for instance, cities like Washington, DC have airport codes like IAD and DCA; the code for Key West, Florida, is EYW, while Newport News’ code is PHF, short for Patrick Henry Field. PDX, LAX, SRQ, and CYS: The airport codes for Portland, Oregon; Los Angeles, California; Sarasota, Florida; and Cheyenne, Wyoming, respectively, do all have one thing in common. The last letter of each of these cities’ airport codes are just filler letters that mean nothing at all. Many airports with filler letters (like LAX) were around at a time when airport codes were only two letters long, before the explosive growth in aviation created the need for a longer code so more letter combinations would be available. MSY: Last, and certainly the best airport code story of all is the three letter code designation of the Louis Armstrong New Orleans International Airport. On the last day of 1910, John Moisant, the first person to build and fly a plane with an all metal frame, and the first pilot to fly over the English Channel with a passenger and an animal, died of a broken neck after he was thrown out of his nose-diving aircraft at the current location of New Orleans’ major airport. Stockyards for cattle were later put on the land where Moisant met his fate. The owners wanted to honor John Moisant, so they called the stockyards the Moisant Stock Yards or MSY for short. The city of New Orleans later bought the stockyards for airfield construction and named the completed project Moisant Field. In 1962, Moisant Field was renamed New Orleans International Airport, but the stockyards’ designation still remains to this very day, and that’s no bull! Roy Barnes is a freelance writer who lives in Cheyenne, Wyoming. He has been employed in the travel agent and airline industries. Very interesting background on these. Thank you for sharing. Please note that the end of the first paragraph and the beginning of the second paragraph about MSY seem to have some grammatical errors. Looks like perhaps the enter key was accidentally pressed mid-sentence. Otherwise, good stuff!